Typographic terminology is sometimes very specific, and the nuances can be confusing. Here are three pairs of terms that are frequently misunderstood. They are related, but refer to different things. Understanding the distinctions will enable you to communicate more clearly, typographically speaking. This will also help you to make the best use of your fonts and software. Italics and obliques are two different varieties of angled, or slanted, typestyles. A true-drawn italic is an angled typeface typically designed as a companion to a roman (straight up and down) design. It is usually a separate design from its roman companion, with its own design features and character widths. Italic typefaces often “feel” somewhat calligraphic in spirit. 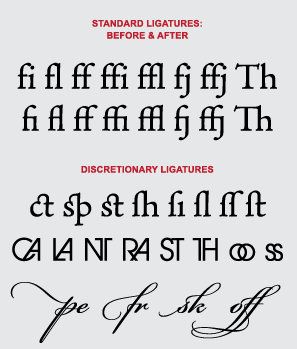 The differences between italics and obliques are demonstrated in the upper two showings. 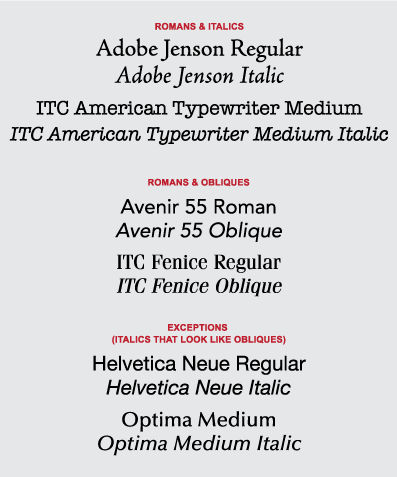 Some typefaces do not follow this design distinction, as shown in the exceptions. With the growing use of OpenType fonts, more people are taking advantage of the availability of old style and lining figures. However, the difference between tabular and proportional spacing remains mysterious to many. The two styles serve distinct purposes, so knowing which to use when is worthwhile. Tabular numerals all have the same total width (consisting of the width of the actual glyph plus the space “built in” before and after the glyph, so they don’t crash into each other). The consistent width allows tabular numerals to align vertically in tables – and price lists, invoices, financial statements, or other columns of figures. Proportional figures, on the other hand, each have a unique width, creating even spacing and color within a multi-digit numeral and throughout a series of numerals. 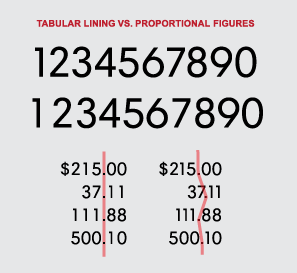 Unless you are setting figures in a column, use proportional figures to avoid the uneven spacing of tabular figures, especially around the numeral 1. NOTE: Many OpenType fonts that offer more than one style of figures default to the tabular numeral setting, so you will need to select the style you want to use. Tabular figures are meant for use in columns, where they will align perfectly. Proportional figures won’t. A ligature is a character made by connecting or combining two or more characters. They may be combined into one continuous letterform, or just designed to “nest” together. Standard ligatures serve a practical purpose: they eliminate the unattractive collision that occurs between some characters when set next to each other. The most common standard ligatures are the f-ligatures: fi, fl, sometimes ff, ffi, and ffl, and occasionally others, especially in OpenType fonts. Discretionary ligatures are more decorative than standard ligatures and can be used at your discretion. They come in many varieties, but they’re all intended to add visual interest to your typesetting. Some of these characters combine common letter pairs (like Th) into a single, graceful design. Other ligatures, such as the ck, ct, and st combinations found in many historic designs, add elegance and a sense of authenticity to a setting. Still others are designed to convey a sense of fun, individuality, or, in the case of some decorative scripts, a spontaneous, almost hand-lettered feel. Standard ligatures offer solutions to typographic collisions or other awkward combinations of letterforms. Discretionary ligatures are more decorative in their intention and should be used appropriately and sparingly.